It was all go last night on the political front. 5 days after the election, Gordon Brown (former Prime Minister) jumped in his Jaaaaag and drove to Buckingham Palace to hand in his resignation. 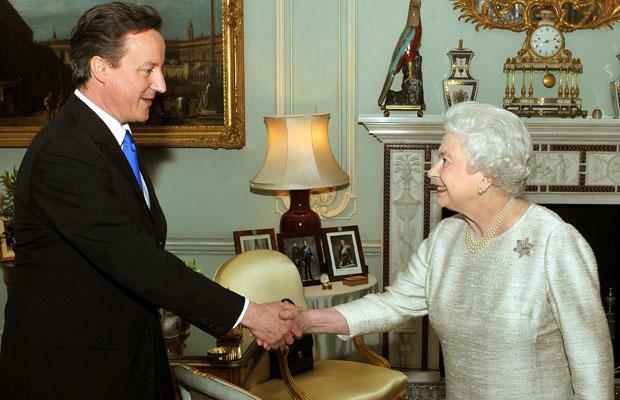 Not long after David Cameron (Conservative) jumped into his Jaaaaag, popped into to visit the Queen and finally he became Prime Minister. What a day, and what a time for British politics. We now have the first peace-time coalition government with the Lib Dems in a position in government they could previously only dream about. I bet Nick Clegg (Lib Dems) never thought he'd find his party coming third (well he would have thought about this - it's the norm) and still find himself with the responsibility of being deputy Prime Minister. We'll find out more over the next few days about the exact agreement the Conservatives and the Lib Dems have reached, but initial reports looks like both parties have managed to keep a fair few of their big policies and have been adult enough to reach a compromise and put others on the back burner in the name of obtaining a stable government that can actually work to solving some of this country's biggest problems. This coalition will certainly change the population's views on our political system and we'll see if it'll work in the long run; after all, coalition governments are the norm in a lot of other countries. We'll also see if the population really wants a proportional representation system (the alternative voting system is on the cards) or stick with what we've got now. As with everything, time will tell, but I think we're in for the most exciting politics this country has seen in years and I hope it actually works out.